1. Fantasia: the arioso motion of the beginning - with a baroque flourish included - as well as the interval e´´ - b´´ reappear several times in the course of the movement, marking formal sections. Recurring series of notes and their possible inversions and transpositions evolve in a chain of variations. In extreme pp, the movement fades away on a b´´´. 2. The Burlesque introduces a restless, virtuoso element into the proceedings. Ideas from the first movement are taken up again and integrated into the structure. 3. Metamorphoses: additional musical material is brought in alongside existing. Rhapsodic and recitative-like sections contrast with rhythmically accentuated passagework. This movement, in adding together all the material, functions as a development section for the two previous movements. 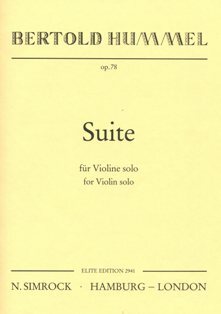 Joshua Epstein is the soloist in the Suite für Violine solo, op. 78, which is also dedicated to him. It builds on earlier models, principally Johann Sebastian Bach. Reger, Hindemith and Prokofieff all profited from the already far advanced virtuosity of the performers' technique. Hummel has given the violin its due: he understands the sounds available and the technical reserves and exploits them effectively, filling them with musical impulses whose brilliance is appreciated by Epstein.